It’s nice to see the world has been discovering the incredible flavour profiles of Belizean chocolate. Whether it’s made in the country where the fruity flavoured cacao is grown, or the chocolate is made abroad with cocoa beans that have been shipped to a growing number of chocolate makers, Belize chocolate is winning an increasing number of international awards and is worth searching for. Belize is growing great tasting cacao and making some terrific chocolate. As I mentioned in last week’s post, I was invited to Belize by the Belize Cacao Consortium who operate the Peini Cacao Plantation. This multi-national company also makes Mahogany Chocolate from their cocoa beans, so I will begin by sharing some information about Mahogany Chocolate (pictured above), originally made in Ambergris Caye in northern Belize, now also being made in the new Peini factory in Punta Gorda located in southern Belize where the cacao is grown. It doesn’t get any fresher than that. Luis Armando Choco is the executive chocolate maker at Mahogany Chocolate. In the picture above, he demonstrates how the roasted cocoa nibs are poured into the top of the crushing machine, and come out a creamy chocolate mass in the bottom within a matter of seconds! This mass is then further refined and processed to create the couverture that makes the finished chocolate products. Mahogany Chocolate provides the pillow truffles for the Mahogany Bay Resort and Beach Club on Ambergris Caye. Their full line-up of chocolate products can be found at their chocolate workshop in San Pedro, Ambergris Caye and at a growing number of locations throughout the country. The chocolate couverture which is used to make the chocolate bars and bonbons is made at the new location in Punta Gorda. Chocolate workshops are offered from the San Pedro location. Mahogany Chocolate makes two primary bars: the Belizean 72% dark chocolate bar, and the Brukdown 50% milk chocolate bar featuring peanuts, cocoa nibs and almonds. The Brukdown (meaning ‘party’ in Belizean) bar is a lot of crunchy fun! Being a nut nut, I quite enjoyed it. Also located in Punta Gorda is the Cotton Tree Chocolate workshop and retail store. This operation is in stark contrast to Mahogany Chocolate’s operation, which is high-tech and sanitized. At Chocolate Tree, a rooster was assisting with the roasting process. 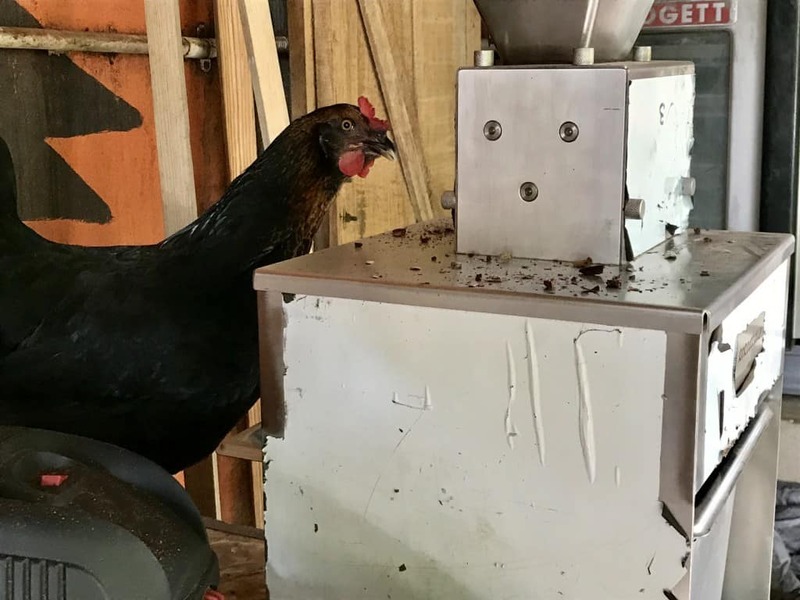 Just kidding, but there was indeed a rooster on the counter while the cocoa beans were in the counter-top roaster and cocoa beans were being hand peeled out back. 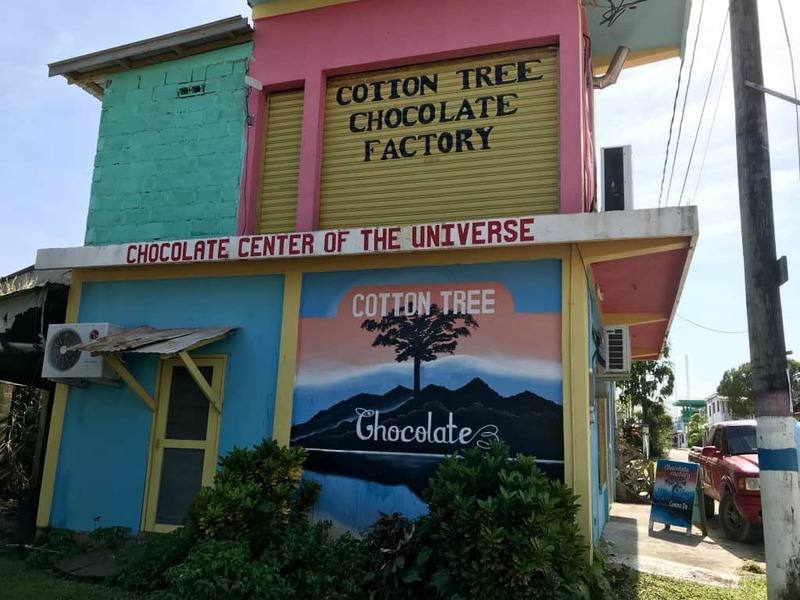 You’ll find Cotton Tree Chocolate in the heart of Punta Gorda and at the Belize Chocolate Festival. I wonder if roosters enjoy pecking at cocoa nibs? This one seemed to be attracted to the smell of the roasting cocoa beans. From Punta Gorda, we made our way to Placencia, which is where I met Lyra Spang, owner of Taste Belize. Lyra conducts chocolate tours to Ixcacao Maya Belizean Chocolate owned by Juan and Abelina Cho, whose cocoa farm is located in San Felipe, in the Toledo District of Belize. 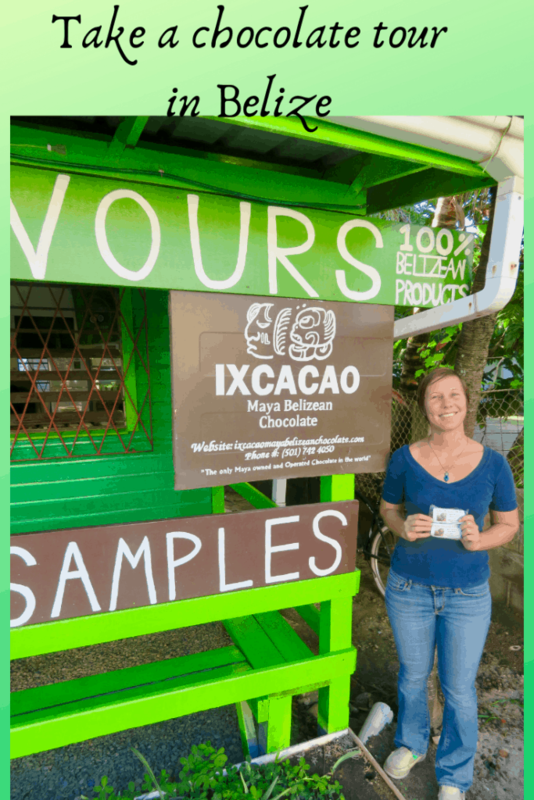 We didn’t have the time to go there, but we did taste and truly enjoy the 80% dark chocolate bar from Ixcacao and I would highly recommend the tour with Lyra that visits Ixcacao. Enjoy some free samples at the Taste Belize tasting hut on the Main Street of Placencia Village. You can book the tours online. Our next chocolate stop was at Lamanai Chocolate Company on the Hummingbird Highway, as we made our way toward Belize City. 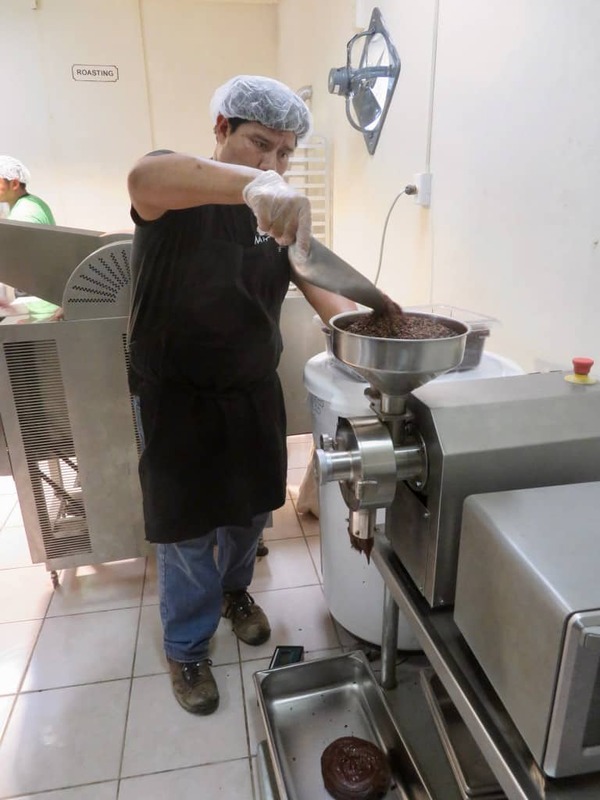 Here, chocolate is made in the Maya tradition and the cocoa beans are hand ground using your muscle power and a stone grinder. Please take one minute to watch the video at the link below to see it in action. rx8V7227Q2eOZc+WcGK+qg. This is a very short video, but if you’d like to see the full version, please drop into my YouTube channel where you’ll find the full version of fresh chocolate truffles in the making! Zoila and her husband Roger run Lamanai Chocolate, located at Mile 430 along the Hummingbird Highway of Belize. 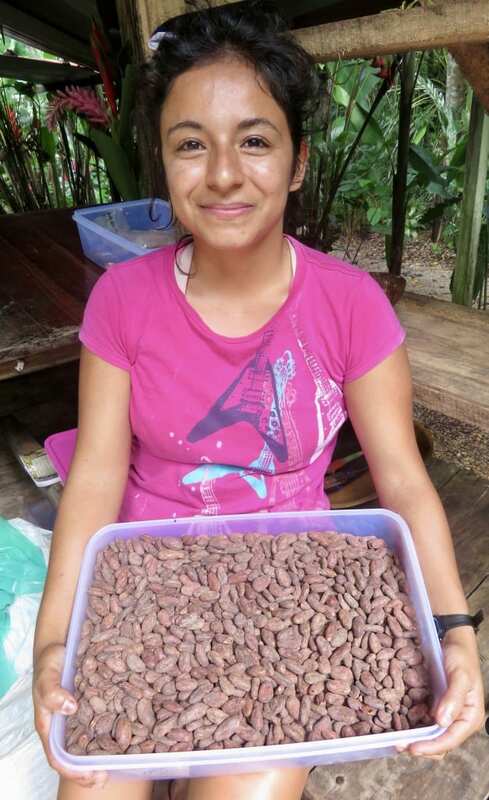 Zoila proudly shows us the big and beautiful cocoa beans used to make their flavour-filled handmade chocolate in the Maya tradition. 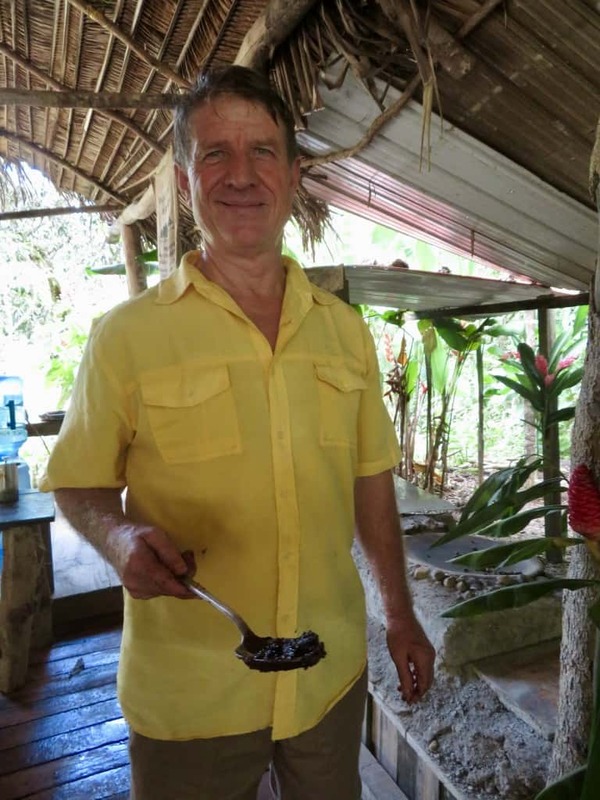 Roger Hale and his wife Zoila give chocolate tours at Lamanai Chocolate that show you how their chocolate is handcrafted in the Maya tradition. Although we didn’t have time to visit them, I can also recommend the chocolate of the Belize Chocolate Company (based in San Pedro) and AJAW Chocolate (based in San Ignacio) who were both kind enough to mail samples to me in Canada. I’m truly grateful for that, as it gave me the opportunity to taste the offerings of all of the major chocolate companies in Belize. Hats off to the Belize Chocolate Company for winning a silver award in the 2018 International Chocolate Awards for its 45% milk chocolate bar. 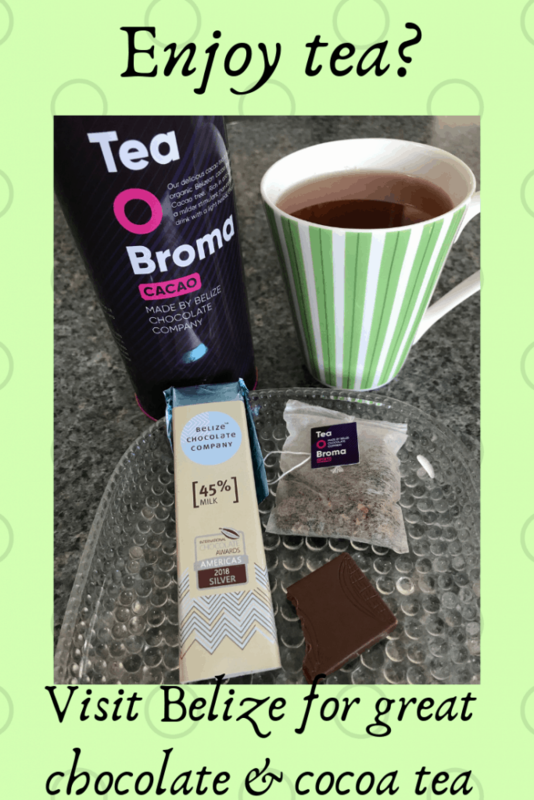 I’ve enjoyed all of their products and especially loved the “Tea O Broma” aromatic cocoa tea made from the husks of roasted cacao beans. It paired exceptionally well with the award-winning milk chocolate. 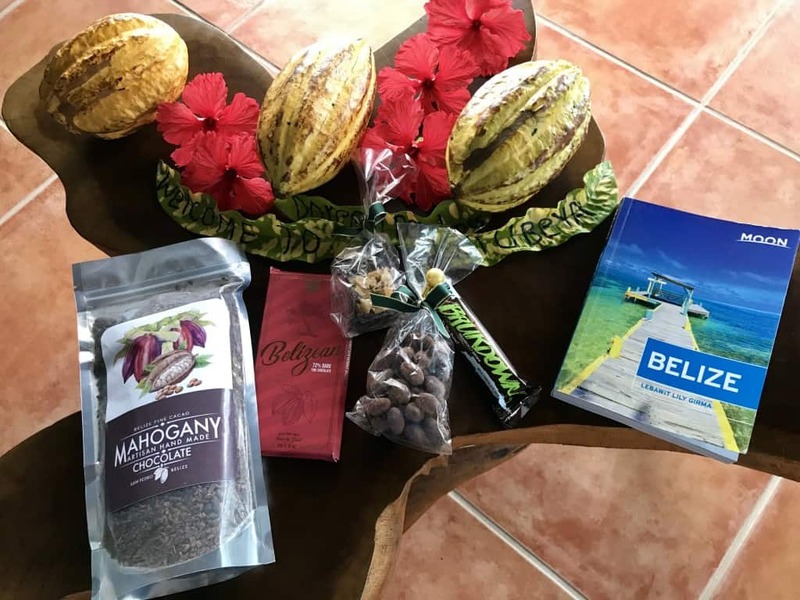 If you happen to be fortunate enough to be heading to Belize and are interested in learning more about Belize chocolate, you might want to time your visit for the Belize Chocolate Festival. The 2019 Chocolate Festival of Belize is being held May 24-26 in Punta Gorda. They don’t have an operational website at this point in time, but do have a facebook page where I imagine updates will be posted. Lucky roosters! I think I’d enjoy the Cotton Tree Chocolate establishment! Hi Linda and thanks for stopping by. Yes, Cotton Tree Chocolate is a stark contrast to the very sterile environment at Mahogany Chocolate. They both make great chocolate, but they do it very differently. A rooster, eh? Perhaps he’s cheering them on while they do the hard work! It’s wonderful to see the small businesses making a huge success with chocolate! Hi RoseMary. Yes, I thought that was so cute! It shows how connected to nature this operation is. Very local and authentic. You have provided your readers with a very thorough tour of the chocolate industry in Belize. As always your writing is very educational. I would not have thought there were so many places associated with chocolate to visit. The reading experience has made me hungry for chocolate! Thanks so much for your comment, Bev, and welcome back to Chocolatour. I hope you will have a look at last week’s post which educates readers on the technical side of processing cacao. As a teacher, I think you will enjoy the technicalities of the process. What I find fascinating is how these boutique (artisanal seems overused) chocolate makers have sprung up from the ashes of the big producers like Hershey and Green & Black’s, who used to own an/or source from plantations there. It’s usually the other way around in business. P.S. The roosters seem to follow us wherever we go, Doreen, or maybe we follow them. Chocolate tea is excellent and full of antioxidants. Hi Janet. You are so right. I loved the cacao aroma of the cocoa tea and also the mild chocolate flavour. I’d be curious to learn how much of the nutrients of the cacao are in the husks. I know that they say the potato skins contain most of the nutrients of the potato, so it may be the same with the cacao! Doreen, how different do chocolates made in the Mayan tradition taste? Where are they available and how do we know if a bar of chocolate was made this way? Hi Carol and thanks for your comment. I invite you to watch the video on my YouTube Channel at https://www.youtube.com/channel/UCoiguhYIEQy-OOmXrxpKfPw?view_as=subscriber. You’ll see us eating the freshly made Mayan truffles, made right before our eyes from freshly ground cocoa beans. As Roger from Lamanai Chocolate says in the video, “Bam!” is the impression you get when eating those, as the flavour is so incredibly fresh you will know if when you taste it. To my knowledge, none of the Mayan-style chocolate is available in the US, but perhaps that will change in time as production increases. What an great tour. It was interesting to watch the chocolate being stone ground. I was surprised to see him then just roll some into a ball to make a truffle. It also made me wonder how does heat/tempering alter the taste. You told Carol the taste was incredibly fresh. Are there other changes that come about with the tempering process? Hi Donna and thanks for your comment. You definitely lose flavour when you put chocolate through a lot of processes. Fermentation and low temperature roasting are all you need to develop those rich chocolate flavours. The rest has more to do with texture than flavour. This stone ground Belizean chocolate was incredibly rich and flavourful. But it was not silky smooth like you find in European-made chocolate. Another delicious post, this time on Belizean chocolate. Love the rooster at the Cotton Tree Chocolate Factory–he’s obviously at home at the Chocolate Center of the Universe. The country certainly has a lot to celebrate at the Chocolate Festival of Belize. Thanks so much for your comment, Pamela. Yes, I sure wish I could be at that chocolate fest! I bet a good time will be had by all. An International Chocolate Festival would be something to add to my bucket list! Love your updates on chocolate and all that goes into making those wonderful treats! Thanks so much, Jackie. Chocolate festivals are amazing. I haven’;t been to Greece since I began my chocolate travels, but would love to go back and see what they have to offer chocolate loving travellers. I’ve been wanting to go to Belize for a while … and finding out about their local chocolate industry makes me even more eager to go! I always end up craving fine chocolate after reading your articles! Thanks, Rachel. Then I am achieving my goals to engage people in chocolate travel. I hope you get to Belize soon. It is a great country. So many options for chocolate in Belize. I am a big fan of the stone ground chocolate I’ve had from Mexico, so I’m sure I would enjoy those made at Lamani Chocolate Co. I’m thinking the Tea O Broma would be a wonderful substitute for desert, and I love the fact they are using the husk from the roasted beans. It was interesting to watch the cocoa beans being stone ground into Belizean chocolate. Thanks for the video!